More than two months to go before the gates at Treptower Park open and day passes for Sunday, 11 September, are selling fast. If you do not want to miss the only Radiohead show in Germany, exclusive sets by Major Lazer, Milky Chance, Beginner, James Blake, Róisín Murphy - all three with new material aboard - plus Zedd, The 1975, Years & Years and many more - you better hurry up and get your tickets now. They are still available at 79,00 Euro here on the official website! You want to be treated to some luxury at Lolla weekend? Look no further! 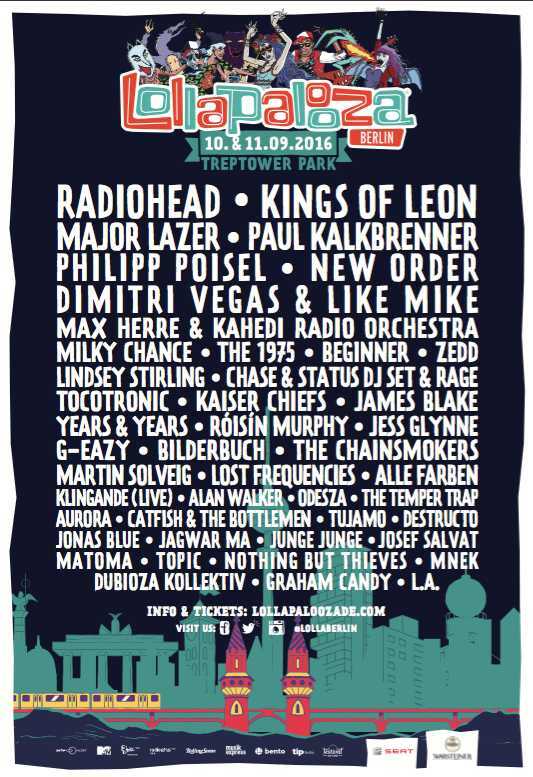 In addition to the regular tickets, Lollapalooza Berlin is offering VIP Tickets and Platinum Tickets for all your Lolla creature comforts. For details, click here. Tickets are available via lollapaloozade.com at €139 (festival ticket) and €79 (day ticket) where you can also check out the daily lineup.